I finally got around to writing up the pattern for my infinity scarf this week. It also has a name too, Pillars. I have it for sale on Ravelry and on my website for $5.00. 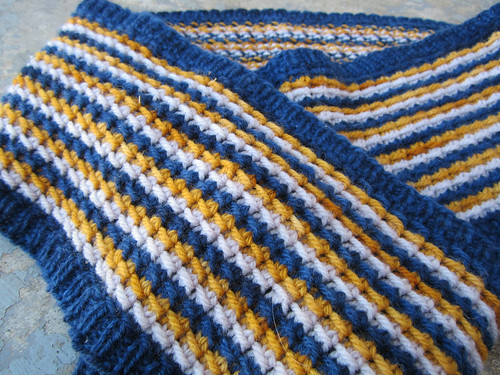 I have only knit it up in this striped version, but it would be great in a single color too. 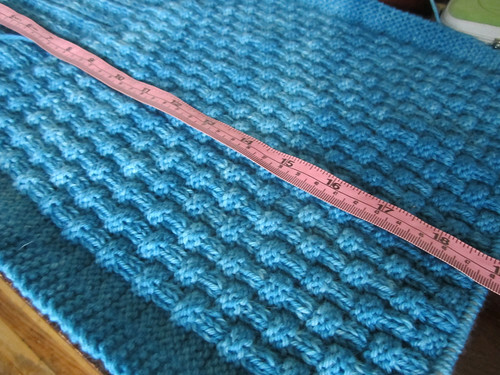 The stitch pattern is fun, easy, and has a nice stretchy texture. Here’s another little fun thing I set up to go along with the pattern release. I was originally envisioning doing this design as a kit. I was going to pick 6-8 color combinations and package appropriate amounts of yarn with the pattern so that you can make the scarf in stripes without the need of purchasing full skeins when you only need 20-25g of a color (you need 40-50g of the main color, but more on that in a minute), but I came up with what I think will be even better. Build your own kits! I have made these adorable mini skeins of the Classic Merino Sport and you can buy what ever combination you want. If you want it the way I made mine with a main color and two contrasts, you will need one ball each of the contrasts and two of the main color. For a single color scarf you one 100g skein. Fun, huh? This is just a few of the colors, but aren’t they the cutest things? 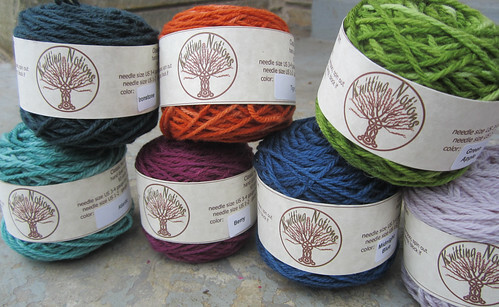 If you visit the link you will see that there are two skein size options there; 100g and 25g. Pick a color and a size and there you are. Then go put the pattern in the cart and you are ready to go. We will see how it goes and if people like it we may even expand the idea to other yarns. Oh, this would be a fun for my Classic Baby Cardigan too. Okay enough with the self promotion stuff, LOL! I have some more progress on the wrap I am working on. It doesn’t look any different, just bigger, but I took a new picture anyway. I am close to the end of the first skein and have almost 20”, so my prediction of it coming out at somewhere between 60 – 64” for 3 skeins seem pretty good. I haven’t talked much about my reading lately, but that’s not for lack of it. I have actually made good progress on my TBR list. I finished my re-read of the Lord of the Rings and it was a pleasure to read as it always is. I swear it just gets better every time I read it if that is possible. I was listening to the new unabridged Audible version as I think I mentioned before, and I will reiterate that is is very well done. I thoroughly enjoyed it. As soon as I finished that I started on Gone Girl, because my number came up on the Overdrive list for the eBook. I can’t remember the last time, not counting books I listen to while on the road, that I have finished book in 2 1/2 days. Wow. It was very interesting and just pulled me in and didn’t let go. I was going back and forth between reading and listening to the Audible version, so that helped, but honestly I just could not put this down. I listened to it while I was churning out those mini skeins you see up there, LOL! If you are one of the few people who haven’t read this one I encourage you to do it. I am not usually one to read something just because it’s popular, but I think this time there is a good reason for it. So after I finished Gone Girl I started Clockwork Angels because I am a total Rush geek and I simply have to read it for that reason. So far so good. I just started it last night. Okay that’s all for today! Happy knitting and reading!